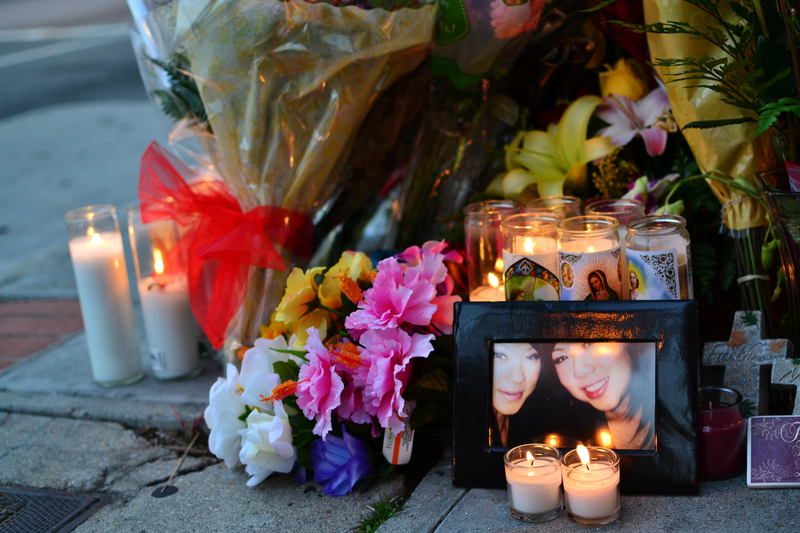 Pictures, flowers and candles began being set up at a make-shift memorial on Monday afternoon. Here is the memorial early Monday evening. 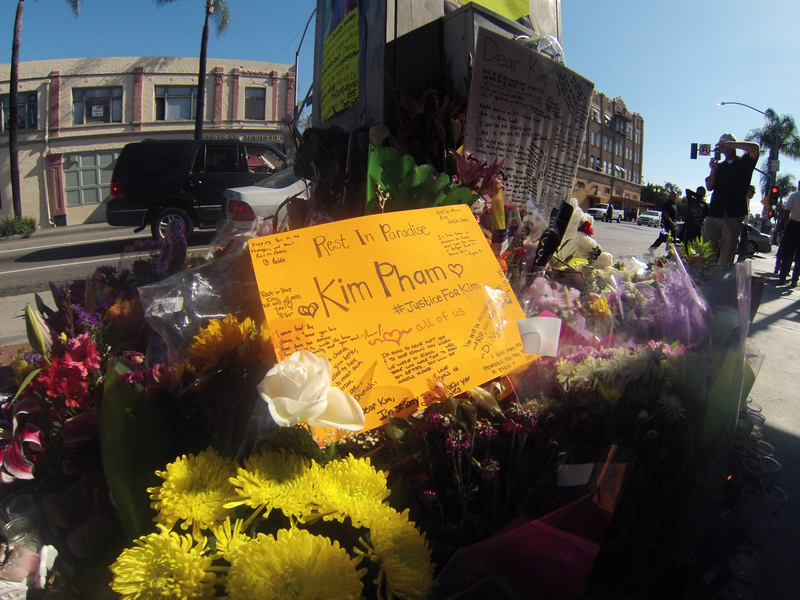 The memorial for Kim Pham, who was allegedly fatally beaten in front of The Crosby in downtown Santa Ana over the weekend, continued to grow Wednesday, as an increased police and private security presence was noticeable in the downtown area surrounding the Starbucks and memorial. The increased police presence is the result of Santa Ana police Chief Carlos Rojas’ Tuesday night announcement that the police department will have an increased police presence and will expand the use of technology to monitor the downtown district, according to a news release. At least three private security guards were stationed within eyesight of the memorial on Wednesday night. Additionally, the city has agreed to pledge a $5,000 reward for information leading to the arrest of other suspects in the alleged beating to match a separate $5,000 reward that would be given from Downtown Inc. In her article, she questions the Fullerton police’s use of force while beating Kelly Thomas, which led to his death. People wishing to donate to Pham’s family in their support can visit a webpage set up by her friends here. A Santa Ana police car drives by the memorial on Wednesday night. 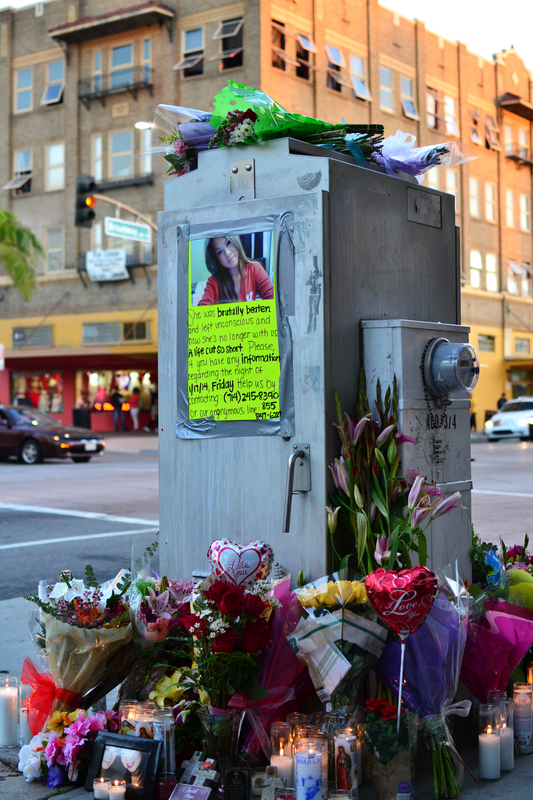 Friends and supporters gathered Monday night at a memorial set up for a woman who was fatally beaten outside a Santa Ana bar on Friday night. Many people brought flowers, candles and notes in their support. At one point on Monday night, a long-haired Asian man riding a skateboard rode up to the memorial site and said that since, as Monday was Martin Luther King Jr. day, people there should try to change things like this from happening in the future. “None of us here should let anything like this ever happen again,” the man said, before skating off. It was not known if he was a friend of the woman. Police at this time have not officially released the woman’s name. They are asking for residents who may have any information on the incident to contact the Santa Ana Police Department or the Orange County Crime Stoppers. 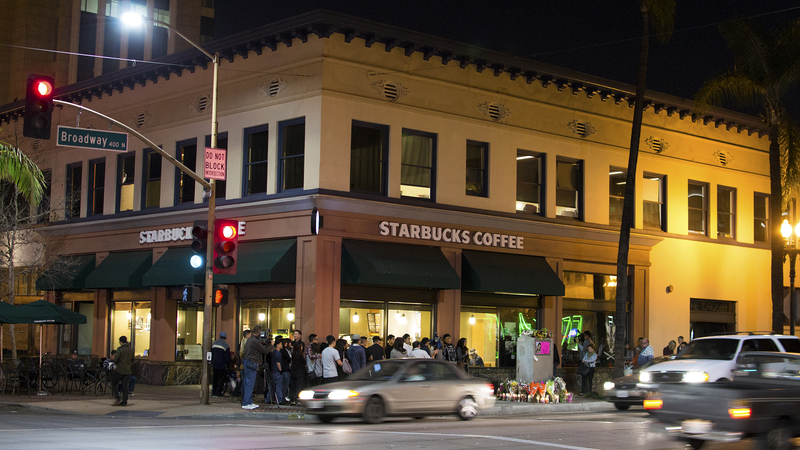 Friends and supporters visit a memorial set up in front of Starbucks and The Crosby on Broadway and Fourth in Downtown Santa Ana on Monday night. By Tim Worden. Published Jan. 20, 2014. Updated Jan. 22, 2014 at 9:30 p.m.